Galerie Beyeler, Basel (no. 1866). Private collection, Switzerland, by whom acquired from the above in 1959; sale, Christie's, London, 2 April 1990, lot 27 (sold for £ 1,760,000). F. Fels, L'Art Vivant de 1900 à nos jours, vol. I, Geneva, 1950, no. 107 (illustrated p. 169; incorrectly dated '1910'). M. Sauvage, Vlaminck, Sa vie et son oeuvre, Geneva, 1956 (illustrated pl. 63). Geneva, Musée de l'Athénée, 1958, no. 18. Basel, Galerie Beyeler, Les Fauves, June - August 1959, no. 47 (illustrated pl. 21). Geneva, Musée de l'Athénée, De l'Impressionisme à l'Ecole de Paris, 1960, no. 100 (illustrated). Bern, Kunstmuseum, Maurice de Vlaminck, February - April 1961, no. 137. Lausanne, Palais de Beaulieu, Chefs d'Oeuvre des Collections Suisses de Manet à Picasso, May - October 1964, no. 177 (illustrated). Paris, Orangerie des Tuileries, Chefs d'Oeuvre des Collections Suisses de Manet à Picasso, May - October 1967, no. 160 (illustrated). Mechelen, Cultureel Centrum, Fauvisme in de europeese Kunst, September - November 1969, no. 26. Maïte Vallès-Bled and Godelieve de Vlaminck will include this painting in their forthcoming Vlaminck catalogue raisonné being prepared under the sponsorship of the Wildenstein Institute. 'What I could have done in real life only by throwing a bomb which would have led to the scaffold I tried to achieve in painting by using colour of maximum purity. In this way I satisfied my urge to destroy old conventions, to 'disobey' in order to re-create a tangible, living, and liberated world' (Vlaminck, quoted in S. Whitfield, Fauvism, London, 1996, p. 33). Painted circa 1907, Le remorqueur à Chatou is filled with the vibrant, sheer colours so distinct in the works from the highpoint of Maurice de Vlaminck's Fauvism. The various areas of this river scene, with the tug chugging along, have been rendered with swathes of pure colour. The intensity of these colours is the result of the fact that Vlaminck has deliberately avoided all tone, all modulation. Instead, the colours have been applied unmixed, the rippling water and its reflections perfectly captured through the use of bold areas of white and blue, occasionally articulated by a flash of red. Meanwhile, the far bank is a vivid blaze of yellows and reds. This picture shows the Seine at Chatou, which would serve as the cradle for Fauvism, and which had been immortalised by illustrious and sometimes rebellious artists for the past half century, not least the Impressionists, although it had changed in character by this time, a result of the rigours of time, industrialisation and so-called progress. 'One day I went to the van Gogh exhibition at Bernheim's in the rue Lafitte. I saw Derain in the company of an enormous young fellow who proclaimed his enthusiasm in a voice of authority. He said, 'You see, you've got to paint with pure cobalts, pure vermilions, pure veronese.' I think Derain was a bit afraid of him. But he admired him for his enthusiasm and his passion. He came up to me and introduced Vlaminck... To tell the truth, the painting of Derain and Vlaminck did not surprise me, for it was close to the researches I myself was pursuing. But I was moved to see that these very young men had certain convictions similar to my own' (Matisse, quoted in J. Elderfield, The 'Wild Beasts': Fauvism and Its Affinities, Oxford, New York & Toronto, 1976, p. 30). It was with the endorsement of the older Matisse that these young artists gained a foothold on the art scene and subsequently that they gained exhibition space at the 1905 Salon d'Automne, the occasion upon which the critic Louis Vauxcelles dubbed the paintings 'Fauves'-- and thereby lent the movement a name. The success of Vlaminck, and of the Fauves at large, continued apace. 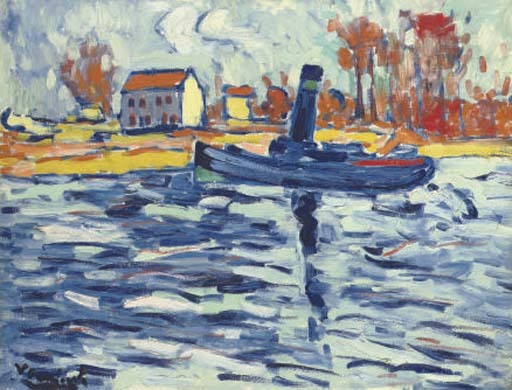 The following year, his paintings were purchased en masse by the legendary dealer Ambroise Vollard, allowing Vlaminck some financial security for the first time in a long while-- he had also been moonlighting in various other jobs and guises, not least as an author, a profession which almost led to his winning a literary prize during precisely this vintage period of his Fauvism. 'I knew neither jealousy nor hate but was possessed by a rage to recreate a new world, the world which my eyes perceived, a world all to myself. I was poor but I knew that life is beautiful. And I had no other ambition than to discover with the help of new means those deep inner ties that linked me to the very soil' (Vlaminck, quoted in John Rewald, Vlaminck: His Fauve Period, exh.cat., New York, 1968, pp. 2-3).